Pygame module for interacting with joysticks, gamepads, and trackballs. pygame.joystick.init — Initialize the joystick module. pygame.joystick.quit — Uninitialize the joystick module. pygame.joystick.get_init — Returns True if the joystick module is initialized. 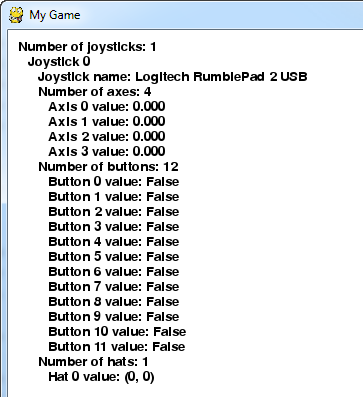 pygame.joystick.get_count — Returns the number of joysticks. pygame.joystick.Joystick — Create a new Joystick object. The joystick module manages the joystick devices on a computer. Joystick devices include trackballs and video-game-style gamepads, and the module allows the use of multiple buttons and "hats". Computers may manage multiple joysticks at a time. Each instance of the Joystick class represents one gaming device plugged into the computer. If a gaming pad has multiple joysticks on it, than the joystick object can actually represent multiple joysticks on that single game device. The event queue needs to be pumped frequently for some of the methods to work. So call one of pygame.event.get, pygame.event.wait, or pygame.event.pump regularly. This function is called automatically by pygame.init(). Returns True if the joystick module is initialized. Test if the pygame.joystick.init() function has been called. Returns the number of joysticks. Create a new Joystick object. You can call the Joystick.get_name() and Joystick.get_id() functions without initializing the Joystick object. This will uninitialize a Joystick. After this the pygame event queue will no longer receive events from the device. Example code for joystick module.